44 x 56 cm (17″ x 22″approx) Oil on Panel.© The Artist. Well, this is about as far as I can take this one (I think…when a painting is knocking about in the studio, I sometimes see many more other things that might possibly be done). It’s what I call a ‘large small’ painting, not quiet a medium size but certainly not a post-card size minature. When working on plein-air paintings in the studio, there’s always the risk of losing the ‘freshness’ that can be found in ‘being there’ on the spot, the experience of the event, in that unique & particular moment in time. I’ve felt extra close to the river Dordogne this past week, as we’ve had old friends & god-children down to stay on holiday. We all went for a really long lovely (no better word) canoe trip on the Dordogne. I post below something more like the the ‘canoe’s -eye view’. A truly beautiful river. These memories live in the mind’s eye, and guide the hand to see better the essential in the scene before one. 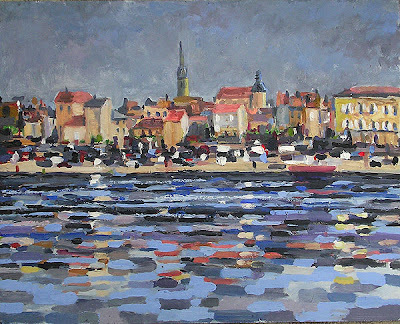 The Dordogne at Bergerac is large & wide, dark & strong, sometimes mirror-like or sometimes, like in the above painting, all cut-up, stormy & more like the sea than a wee river. Begerac is the town where we were married, where my wife &, now, my two children were born. A really good town. A good place to paint.– even in the rain! 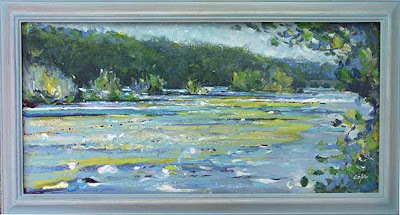 ‘Reedbeds at Lalinde’ 72 x 36 cm.